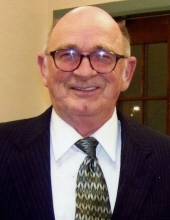 Celebrating the life of Stanley R. Stanfill Sr.
Obituary for Stanley R. Stanfill Sr.
Stanley R. Stanfill Sr., age 74, of Tidal Shelby Street, Williamsburg departed this life on Friday, January 11, 2019 at Saint Joseph of London. He was born on July 8, 1944 in Jellico, Tennessee to the late Shird and Arnith (Martin) Stanfill. He was also preceded in death by a brother, Tommy Stanfill and a sister, Evelyn Justice. Stanley was a member of Riverside Church of God. He enjoyed local sports and being with family. He is survived by his wife, Helen (Hurst) Stanfill of Williamsburg; five sons, Stanley Stanfill Jr. (Lisa), Archie Stanfill (Patricia) of Williamsburg, Richie Stanfill (Lena) of Corbin, Phillip Stanfill of Williamsburg and Carl Stanfill (Elizabeth Hill) of Williamsburg; 12 grandchildren; 16 great grandchildren; four brothers, Earl Stanfill of Williamsburg, Roger Stanfill of Three Rivers, Michigan, Freddy Stanfill of Barbourville and Billy Joe Stanfill of Goshen, Indiana; sister, Sarah Hurst of Williamsburg; several nieces and nephews; and a host of other family and friends to mourn his passing. Visitation will be after 6:00 P.M. Tuesday, January 15, 2019 at Croley Funeral Home. Mr. Stanfill will Lie-in-State at Riverside Church of God from 11:00 A.M. until the funeral hour on Wednesday, January 16, 2019. The Funeral Service will be at 2:00 P.M. Wednesday, January 16, 2019 at Riverside Church of God with Rev. Randy Halcomb officiating. Following the Service he will be laid to rest in the Croley Addition of Highland Park Cemetery. James Shepherd, Luke Stanfill, Mark Brown, Dustin Stanfill, Darrin Stanfill and Kris Stanfill will serve as pallbearers. To send flowers or a remembrance gift to the family of Stanley R. Stanfill Sr., please visit our Tribute Store. "Email Address" would like to share the life celebration of Stanley R. Stanfill Sr.. Click on the "link" to go to share a favorite memory or leave a condolence message for the family.